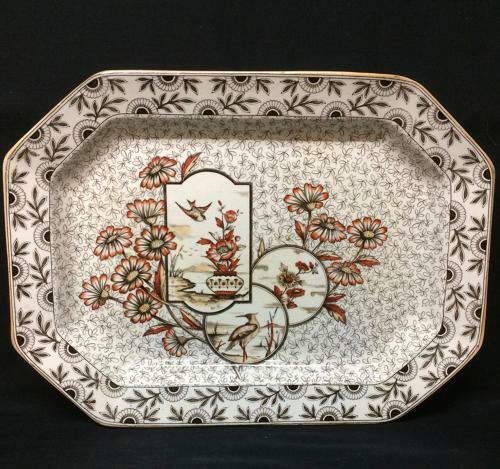 This large Victorian brown aesthetic 16 3/8 " long x 12 " wide platter is transfer printed in very dark brown with spectacular under the glaze hand painting in red ochre and orange. The pattern features a fancy pin wheel flower border around a completely covered well with oversized daisy type flowers and three magnificent cartouches. One has a vase full of oversized exotic flowers next to a lake with a songbird in flight. Another has sprigs of blooming daisies and the final cartouche has a very unique tufted long billed aquatic bird. This is a delicious platter. Great Condition. The platter displays beautifully or is ready for use, clean shiny and bright with no chips, cracks, hairlines or repairs.